Bangle to designers: Where's the innovation? 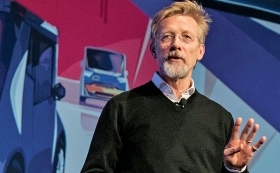 DETROIT — Former BMW chief designer Chris Bangle continued his comeback tour last week at the Automotive News World Congress, where he critiqued U.S. politics, expounded on theories of civilization and skewered modern car design as trite and unoriginal. "There's a safe harbor where basically all the brands are," Bangle said. "That's why all the cars look the same." Since leaving BMW in 2009, the designer largely steered clear of the automotive world, instead helming his consultancy, Chris Bangle Associates in Italy. It was his palpable frustration over current car design that led him to his latest automotive project. The REDS electric vehicle is a tall, boxy commuter car for future Chinese megacities. A prototype concept was first shown in November at AutoMobility LA. REDS was created for Chinese heavy-truck and bus manufacturer China Hi-Tech Group and will be manufactured by newly formed company REDSPACE. "It looks like a little kid's car," Bangle said. "We didn't have a brand to work around. I felt we had a client that finally understood." 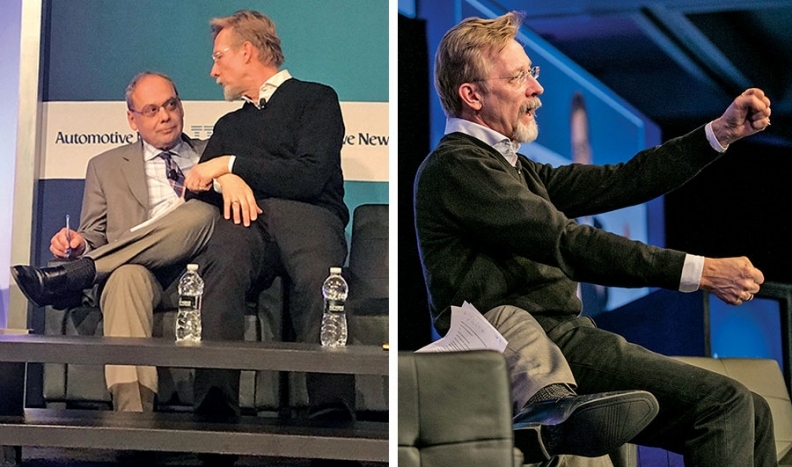 An animated Chris Bangle gets up close and personal with Automotive News Print Editor Richard Johnson while demonstrating new ideas for seating positions in future cars. The design was influenced by Bangle's desire to break the mold, with a spacious interior, a concave exterior for passengers to lean back while facing one another and a utilitarian front end. It eschews speed for practicality, with an unorthodox seating arrangement that drops the front passenger seat to allow more cargo and legroom. While not explicitly designed as a self-driving car, Bangle indicated it could be adapted for an autonomous age. "It's not a bunch of hocus pocus," Bangle said of the design process. Three women on his team at the time were pregnant, which forced Bangle to think ahead. "Who are we designing for in the future? Which car can we change a diaper quicker?" Bangle has a history of divisive yet prophetic cars. His bulky BMW X-Coupe concept, shown at the 2001 Detroit auto show, was mocked at the time but foreshadowed the eventual crossover craze that would sweep the industry. Since becoming a consultant, Bangle has advised car companies on design management but kept a low profile at the request of his former employer. Last year, an appearance at the Frankfurt auto show sparked rumors of a return to the industry. Yet Bangle demurred on confirming any future car designs. Instead, he's having too much fun illustrating children's cartoon "Arky Arch Adventures." "We'll see, we'll see," Bangle said. "Cartooning for now is as important as anything else."